Port Houston kicked off its fall Port University course for small businesses Sept. 26 with presentations from various departments about doing business with the port. Port University, a four-week training course, is an outreach program designed to educate small businesses about procurement opportunities at the port. The workshops are presented in collaboration with the University of Houston Small Business Development Center. 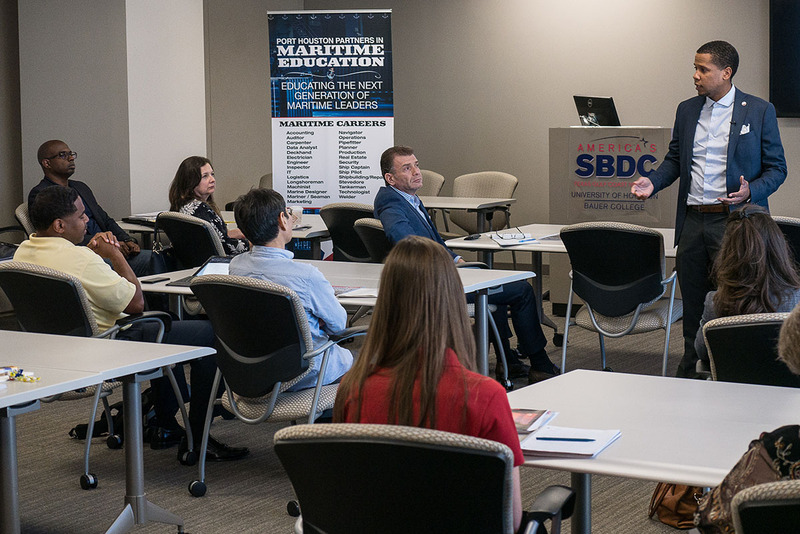 More than 35 small business representatives attended the class, where they learned about port procurement opportunities, port facilities small business program, contracting language, bonding, insurance requirements and the port’s BuySpeed Procurement System. Since inception in 2003, more than 782 small business owners have graduated from Port University. Port Houston staff from various departments provided insight on doing business with the port. The port’s environmental affairs team shared program highlights of interest to potential small businesses, including the environmental management of 8 public terminals, environmental auditing and the port’s environmental leadership strategy and policy. Port environmental affairs programs include recycling, air quality management, waste management, providing environmental support for port projects as well as a number of other activities, shared Ryan Dixon, lead environmental compliance coordinator for Port Houston. “We strive to go beyond environmental compliance by incorporating voluntary initiatives such as our Environmental Management System, which helps us improve our internal processes and in return leads to a greener port and a healthier Houston Ship Channel,” Dixon said. In addition to the course, attendees are given the knowledge base about other upcoming port small business events and opportunities. Port Houston’s Small Business and Education Outreach department participates in around 200 events every year through the collaboration with various chambers of commerce, economic development organizations and private/public agency partners.